On May 25, 1913, a Providence baseball team was playing against another team from Jersey City, New Jersey, at a baseball field that overlooked Narragansett Bay. Part of the post-game festivities included a flight exhibition given by aviator Harry M. Jones, who was locally famous for being the first to fly mail from Boston to New York. Just after 5:00 p.m., his bi-plane was maneuvered to the area of first base in preparation for take off. As “cargo” Jones was taking along a box of baseballs, which he planned to drop from the air to players on the field. From the start Jones seemed to be having trouble getting the motor to start and keep running, but after several attempts he was successful, and took off in view of several thousand spectators. After circling the field a few times at an altitude of 50 feet, he began getting ready to drop the baseballs when the engine suddenly quit. As the plane began loosing altitude, Jones tried to restart the motor but couldn’t. His glide path was taking him directly towards the huge crowd of people on the ground who at that point were beginning to scatter in all directions. Fortunately Jones had just enough altitude to swing the aircraft towards Narragansett Bay, where he crashed into the water and sank with his plane. Several seconds later he bobbed to the surface, shaken and bruised, but otherwise unhurt. It took four hours to recover the plane from the water. 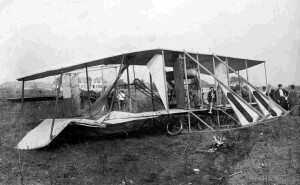 Jones was involved in a more serious crash in Narragansett, Rhode Island on August 9, 1914. For more details, see Rhode Island Civil Aviation Accidents on this website. It was the Wright Brothers who set the standard for what a mechanically powered aircraft should look like, and each subsequent builder copied their basic design. Early airplanes were flimsy compared to what came later, jokingly held together with bubble gum and bailing wire; home built products manufactured in barns, (or bicycle shops) and not in hi-tech factories. Some actually flew; many did not; and those that could, didn’t always stay in the air. Accidents were common, but that didn’t deter young men like Pawtucket’s Jack McGee from climbing into one of those “newfangled flying contraptions” and taking to the sky. 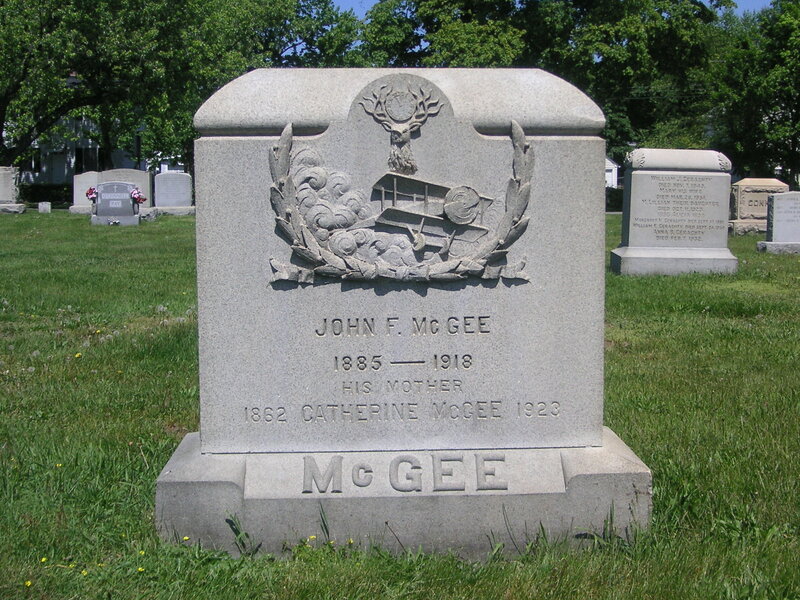 John Francis McGee was born in Central Falls, Rhode Island, on June 18, 1885. One could say he was born at just the right time in history to make his mark as an aviator, for he witnessed the dawn of mechanical flight; a time when there were no manuals, no regulations, and safety was a matter of perspective. It was an era when daring young men made up the rules as they went along while at the same time teaching themselves how to fly. When he was four, Jack’s father moved the family to Maine, but they returned to settle in Pawtucket in 1900. In his youth, Jack worked in a machine shop which gave him valuable experience with engines that would come in handy later on while working on his airplanes. Jack’s interest in mechanics led to an interest in automobiles, which led to his learning how to drive one. This acquired skill eventually landed him a chauffeur’s job with J. C. McCoy of Barrington. Mr. McCoy was an aviator in his own right, and in the spring of 1911 he had Jack drive him to an air show in Massachusetts. It was there that McGee decided he wanted to fly. After borrowing money from a friend, McGee enrolled in the Atwood Aviation School in Cliftondale, (Saugus) Massachusetts. He was a quick study, and flew at the controls, with an instructor aboard, after only three flights. There were no pilot licensing standards or requirements in those days for there were no state or federal regulatory agencies that required one. It was up to the student, with input from his instructor, to determine for himself when he had enough experience to fly alone. Most students took the matter under serious consideration, for aircraft technology was still in the developmental stages, and one mistake in the air could mean a messy end on the ground. McGee continued taking lessons when he could afford them, finally making his first solo flight on August 18, 1912. It was also in 1912 that McGee purchased his first airplane, a Burgess-Wright bi-plane, for the princely sum of $3,050, which he affectionately called “The Kite”. The name resembled the aircraft’s construction; wood, wires, and canvas, powered by a small smoke belching, oil-spitting, engine. The aircraft was primitive by today’s standards, and its seemingly flimsy construction left many wondering how Jack was able to perform such daring feats with it and still live. Yet as rickety as it was, those who could afford it, quickly lined up to pay for a short ride. McGee briefly teamed up with another promising young aviator by the name of Farnum T. Fish who had participated in air shows in the western United States. It was while flying with Fish on the afternoon of July 9, 1912, over Revere Beach, Massachusetts, that McGee experienced what was to be the first of thirteen plane crashes that he would survive during his career. On that day, while Fish was passing low over the water, a wing dipped sending the craft into the surf. 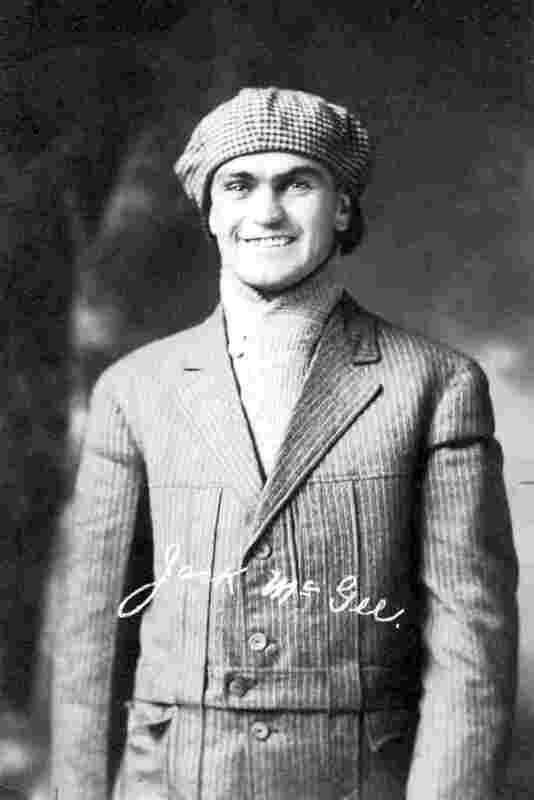 Jack asked his friend, Pawtucket businessman Joseph Boyle, to be his manager, and Boyle did such an excellent job of promotion that crowds estimated to be as large as fifty-thousand people would come to watch McGee perform his stunts. Yet despite the large crowds, the money was slow to roll in. There were operational expenses and loans to pay off, and McGee often went without food so he could feed his passion for flying. In August of 1912, Boyle got McGee a $1,000 contract to fly from Saugus, Massachusetts, to Newport, Rhode Island, to perform stunts for the Newport Beach Association. The flight and exhibition were scheduled for August 25th. However, things began to go awry when McGee left Saugus and ran into strong winds which blew his tiny airplane out over Boston Harbor and towards the sea. Its engine was no match against Mother Nature, and had the wind not shifted he could have been a goner. He managed to set down on a race track in Boston and contacted Boyle in Newport with the news that he wasn’t going to make it that day. The news was disappointing to say the least, for not only were thousands awaiting McGee in Newport, thousands more were waiting in Pawtucket because Boyle had promised Jack would stop in that city on his way to Newport. Boyle was left with only one option; postpone the events by one day and drive to Boston to help Jack prepare for another flight. Jack took off from Boston the following morning, but when he arrived over Pawtucket he found the city shrouded in fog. One of the few visual landmarks available to him was the smokestack of the Hand Brewery, next to which he knew was a relatively flat section of land where he could set down. In the meantime, Boyle returned to Newport and explained that Jack’s arrival would be delayed yet another day. The following morning a large crowed gathered to see McGee off, but more bad luck stymied his trip when he crashed into a tree on takeoff because someone had left a baby carriage in his path. McGee escaped without injury, but the right wing was damaged further preventing his departure to Newport. McGee didn’t have the funds to repair his airplane, and without it, he couldn’t full-fill his contract. 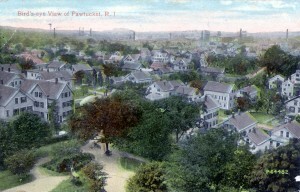 When news of his predicament spread, the good citizens of Pawtucket came to his rescue by taking up a collection. With the wing repaired, McGee was once again on his way to Newport. In Newport, Jack was invited to attend an exclusive party held by Mrs. Belmont on Easton’s Beach. Jack graciously accepted and presented Mrs. Belmont with a yellow banner that read, “Votes For Women”. (At that time, Mrs. Belmont was a leader in the fight for women’s voting rights.) The publicity from Jack’s frustrating trip to Newport, and subsequent high society party invitation gained him national publicity. 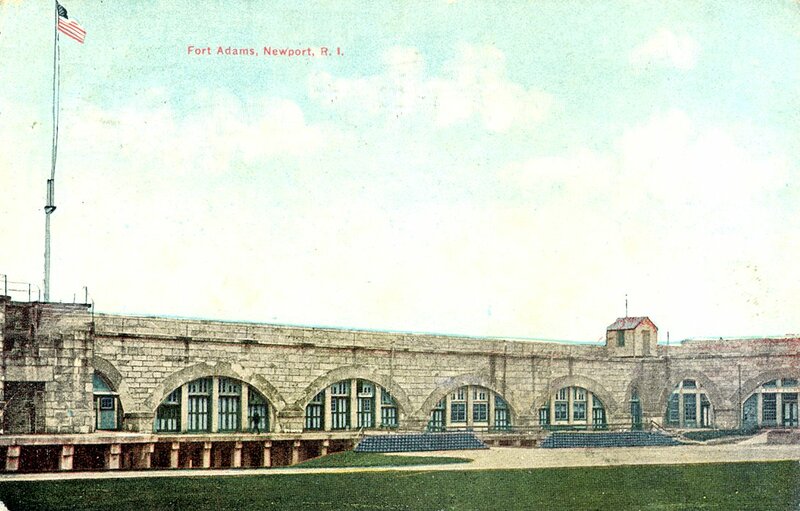 After Newport, he embarked on an exhibition tour around Rhode Island giving shows at places like Crescent Park, Rocky Point, Pawtucket, and Woonsocket. 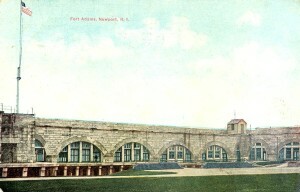 His “headquarters” was located in a special hangar at the Pawtucket Driving Park off Newport Avenue. It was here that he survived yet another crash which put his plane out of commission for several days. 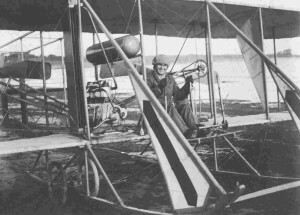 In all, McGee survived thirteen crashes during his career and was once quoted as saying, “It is a general belief among aviators that, if they remain in the flying game long enough, they will eventually be killed. I know that I will be killed some day if I fly too long.” But crashing wasn’t his only worry. On September 3, 1912, he and his airplane were shot at by an irate hunter while passing over some woods in Danbury, Connecticut. The bullet barely missed him as it embedded itself in the plane’s control panel. 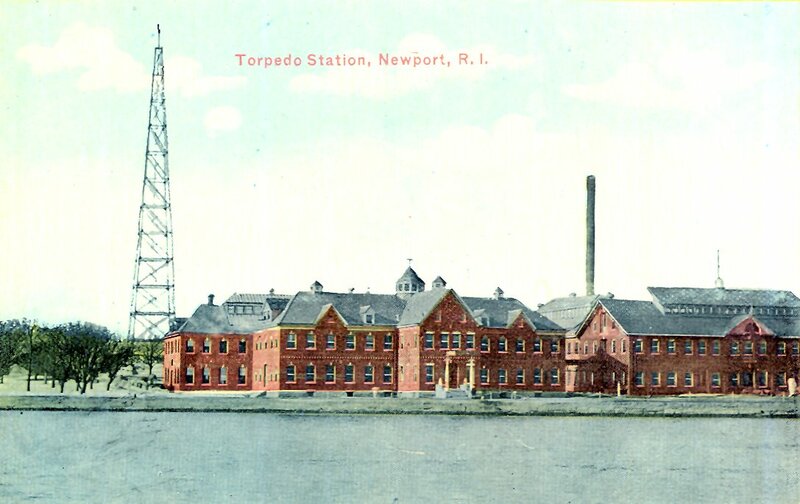 The day before that incident, McGee had gone to Newport to prove a point to the military men stationed at Fort Adams and the naval torpedo station on Goat Island that they were vulnerable to aerial attack by airplanes. McGee was a visionary who foresaw a time when aircraft would have practical military applications, an idea that was slow to be accepted by the armed forces, who saw the airplane as nothing more than a toy for the wealthy and the foolish. This notion by the military was not completely without merit, for World War I was still two years away, and the unreliability of pre-war aircraft, coupled with the high mortality rate of pilots, led many to feel that airplanes were nothing more than a passing fad. 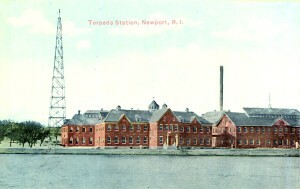 Early Post Card View Of The U.S. Navy Torpedo Station, Newport, R.I.
On the morning of September 2, 1912, McGee took off with bags of flour to drop as “bombs” over his intended targets. McGee knew what he was doing for he had taken part in bomb dropping contests at air meets in Massachusetts, reportedly winning prizes for his accuracy. As he came in high over Fort Adams he let a few bags fall. When they struck the parade ground and parapets they burst apart in simulated blasts. Attached to each bag was a note: “What if this were 16 percent nitroglycerine?” He did the same at the naval torpedo station, and fortunately no irate soldiers took pot-shots at him. Naturally military commanders weren’t pleased with the stunt, but McGee had proven his point. McGee was flying in an age when aviation records for speed, distance, altitude, and endurance, were constantly being set and broken. The ultimate achievement for any aviator of that era would be to fly across the Atlantic, something that had never been done before. Doing so was easier said than done, for aviation technology hadn’t yet reached the point where making such a trip had any real chance of success. 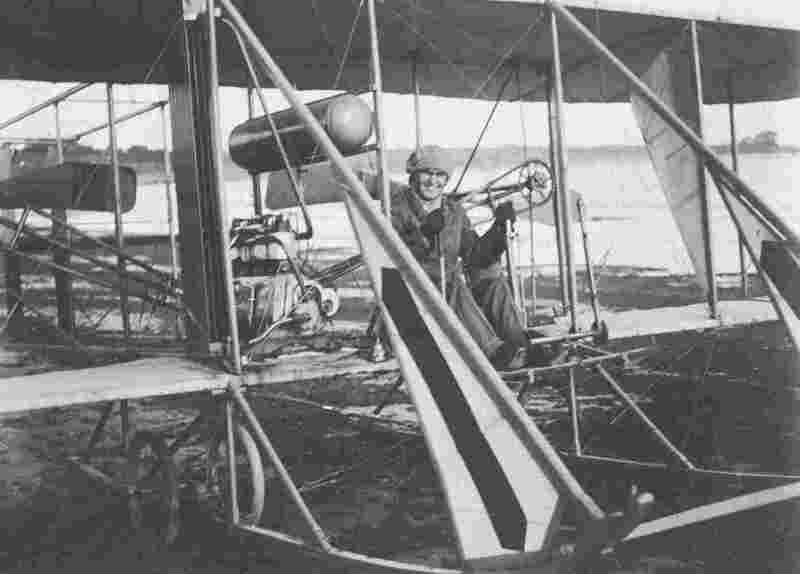 Despite any limitations with his aircraft, in May of 1913, McGee announced his plans to try. It wasn’t just a place in the history books that he was after, it was the $50,000 purse offered by the British Aero Club to the first aviator(s) who could do it. Fifty-thousand dollars in 1913 was a fortune, and certainly would have secured McGee’s financial situation for life. Pawtucket, Rhode Island – As Jack McGee Saw It. McGee’s plan called for naval vessels to be spaced a few hundred miles apart all across the Atlantic from Newfoundland to England to act as refueling stations for his pontoon equipped airplane. It seemed simple enough in theory, and he set his departure date for July 4, 1913. Of course executing such a plan would require money, and lots of it, as well as an incredible amount of logistical planning and cooperation by the U.S. Navy and any other foreign vessels involved. It is perhaps for this reason that investors were reluctant to put money towards the project forcing McGee to cancel his plans. On July 28, 1913, McGee and a companion survived another accident, this time splashing down in the middle of Narragansett Bay. The plane sank beneath the waves and soon afterwards a reward was posted to anyone who recovered it. More than a few rose to the challenge, for besides the reward, there was the publicity, but in the days before underwater sonar, locating it would be purely a matter of luck. The aircraft was finally located and recovered by accident on August 10th by a boat dragging for oysters. McGee’s fame was a lure for souvenir hunters who eagerly sought artifacts from his wrecked airplanes. Several artifacts ranging from propellers to wing struts connected with McGee’s planes are known to have survived to this day and are in the hands of private collectors. Though he himself flew, McGee tried to discourage those he cared about from following in his footsteps. One such person was his good friend Leo Leeburn, to whom McGee had given basic flight training. Mr. Leeburn later went on to join the Army as a flight instructor during World War I, and served as an airbase commander in World War II, eventually reaching the rank of Lieutenant Colonel. Another friend was Henry Connors, who went on to command the Rhode Island National Guard. One day he and McGee raced from Rumford to Crescent Park, Connors in his automobile, and Jack in his airplane – Jack won. 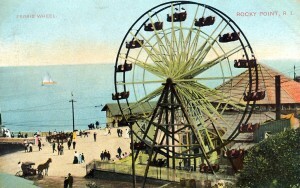 Rocky Point Park, Warwick, R.I. – A once popular destination. McGee and other early aviators flew their planes here. In 1914, Jack purchased a seaplane capable of traveling 70 mph. In May of that year, he was paired with a man who was to parachute from his airplane at an exhibition at Rocky Point. The plan was for the man to ride on one of the plane’s pontoons until they reached an altitude of about 3,500 feet. Unfortunately, the man weighed too much and McGee was unable to take off. 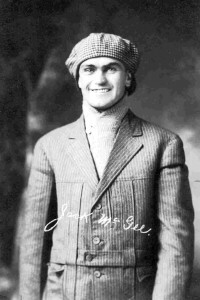 After several unsuccessful attempts, 17-year-old John Downey of Providence approached McGee and offered to perform the stunt. At first McGee declined, but the youth insisted, so a contract was hastily drawn up which the boy took to his father to sign. For never having any formal instruction in leaping with a parachute, Downey reportedly performed admirably, and even returned for an encore performance the following day. It was also in 1914 that World War I broke out in Europe, and Jack was courted by the French Government to join their military aviation corps to instruct their pilots, but he declined their offer. 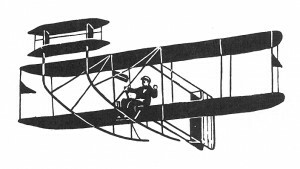 One news snippet which appeared in a magazine known as Aerial Age, on March 22, 1915, stated that McGee had been selected by B. Stephens & Sons of Providence, R. I., “to exclusively fly its hydro-areoplane, the first machine of the kind ever made by a Rhode Island concern which has the added distinction of being driven by the first 12-cylinder air-cooled marine engine ever made in America.” The company was located at Fields Point. In the summer of 1917 McGee accepted a position as a test pilot for Gallaudet Aircraft Corporation of Warwick, Rhode Island. By now, America had entered the war and the Navy had given Gallaudet a contract to build seaplanes for the war effort. The job of a test pilot is a dangerous one. Those who designed the planes had a theoretical knowledge of what the craft’s capabilities might be, but it was the test pilot’s job to make sure they were right, and to see if it was capable of doing more. On June 11, 1918, while testing one of Gallaudet’s planes on Greenwich Bay, the aircraft suddenly nosed over in the water. Those who witnessed the event reported an explosion just after the impact, but officials later denied that an explosion had occurred. In any event, McGee was trapped in the overturned wreckage and drowned. He was 33. Jack was survived by his wife of less than six months, Miss H. Louise Morris of Pawtucket. Jack’s prediction that he would eventually die in an airplane accident proved prophetic, but some might say it was inevitable. During his seven year career he performed hundreds of aerial feats that had killed lesser pilots, and had cheated death in at least thirteen crashes. Over the years, and there have been several attempts to have a permanent memorial erected to his honor, including the naming of a state airport, but unfortunately all efforts have been unsuccessful. Update: Today a bronze plaque to McGee’s achievements is located at the entrance to Slater Park in Pawtucket.